Timeline: The Rise and Fall of Vioxx Five years after Vioxx's launch in 1999, Merck withdrew the drug from the market. By that time, Merck had sold billions of dollars worth of the painkiller worldwide. Merck removed Vioxx from the market after a study showed it could cause heart attack and stroke. Shortly before the FDA approved Vioxx in 1999, drug maker Merck launched a study it hoped would prove that Vioxx was superior to older painkillers, because it caused fewer gastrointestinal problems. Instead, the study would eventually show Vioxx could be deadly, causing heart attacks and strokes. November 1998: Merck asks the Food and Drug Administration (FDA) for approval of Vioxx, having tested the drug on 5,400 subjects in eight studies. January 1999: Merck launches the Vioxx Gastrointestinal Outcomes Research study (VIGOR). With more than 8,000 participants, it is the largest study ever done of the drug. Half take Vioxx and the other half take naproxen. The clinical trial is designed to see whether Vioxx is safer for the digestive system than naproxen, an older painkiller. 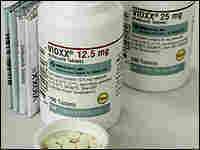 May 1999: The FDA approves Vioxx, making the drug available by prescription in the United States. October 1999: First meeting of the VIGOR study's data and safety monitoring board (DSMB). Study results as of Oct. 1, 1999, show that Vioxx patients have fewer ulcers and less gastrointestinal bleeding than patients taking naproxen. It looks as if the study will be a success for Merck. November 1999: At the second meeting of the VIGOR safety panel, the discussion focuses on heart problems. As of Nov. 1, 1999, 79 patients out of 4,000 taking Vioxx have had serious heart problems or have died, compared with 41 patients taking naproxen. The minutes of the panel's November meeting note that "while the trends are disconcerting, the numbers of events are small." The panel votes to continue the study and to meet again in a month. December 1999: The safety panel holds its last meeting. It's told that as of Dec. 1, 1999, the risk of serious heart problems and death among Vioxx patients is twice as high as in the naproxen group. The DSMB votes to continue study, but decides Merck needs to develop a plan to analyze the study's cardiovascular results before the study ends. DSMB Chairman Michael Weinblatt and Merck statistician Deborah Shapiro draft a letter and send it to Merck's Alise Reicin (now vice president of Merck's clinical research). Later, when defending its decision to continue the study, the safety panel said it couldn't tell if Vioxx was causing the heart problems or if naproxen, acting like low-dose aspirin, protected people from them, making Vioxx just look risky by comparison. January 2000: Merck balks at developing the analysis plan. The company wants to wait and combine the cardiovascular results of VIGOR with results from other Vioxx studies. Weinblatt, the safety panel chair and a rheumatologist with Brigham & Women's Hospital in Boston, pushes for immediate analysis. February 2000: After further discussions, Merck and Weinblatt agree to analyze heart problems reported by Feb. 10, 2000 — at least a month before the last patient leaves the study. Events reported later won't be included in the initial analysis. Feb. 7, 2000: Weinblatt fills out a financial disclosure form that says he and his wife own $72,975 of Merck stock. Feb. 15, 2000: Weinblatt agrees to a new consulting contract with Merck. "We are delighted that you have agreed to serve as a member of the VIOXX Multidisciplinary Advisory Board," Merck writes in an invitation to Weinblatt to attend his first advisory board meeting. Weinblatt signs the new contract on March 6. It involves 12 days of work over two years, at the rate of $5,000 per day. March 2000: Merck gets results of the VIGOR trial. May 2000: Merck submits VIGOR paper to the New England Journal of Medicine (NEJM) for publication. The data include only 17 of the 20 heart attacks Vioxx patients have. July 5, 2000: A memo from Merck statistician Deborah Shapiro to Merck scientist Alise Reicin (both are listed as authors of the NEJM paper) refers to heart attacks 18, 19 and 20 suffered by patients taking Vioxx during the study. July 2000/November 2000: VIGOR authors submit two sets of corrections to their NEJM manuscript. No mention of the three additional heart attacks. Oct. 13, 2000: Merck tells the FDA about heart attacks 18, 19 and 20. Nov. 23, 2000: The VIGOR results are published in NEJM, still with no mention of the three additional heart attacks in the Vioxx group. The published results also leave out data on many other kinds of cardiovascular adverse events. February 2001: The FDA holds an advisory meeting on the VIGOR trials. It publishes complete VIGOR data on its Web site, including the additional heart attacks and data on other cardiovascular events. Aug. 22, 2001: Cardiologists Debabrata Mukherjee, Steven Nissen and Eric Topol publish their meta-analysis in the Journal of the American Medical Association, based on complete VIGOR data that the FDA has made available. Their analysis is significant because they take all the VIGOR data from the FDA Web site, recrunch them, and cast serious doubt on the hypothesis that naproxen protects the heart. January 2002 to August 2004: Numerous epidemiological studies point to Vioxx's increased risk of cardiovascular problems. September 2004: Merck withdraws Vioxx after a colon-polyp prevention study, called APPROVe, shows that the drug raises the risk of heart attacks after 18 months. By the time Vioxx is withdrawn from market, an estimated 20 million Americans have taken the drug. Research later published in the medical journal Lancet estimates that 88,000 Americans had heart attacks from taking Vioxx, and 38,000 of them died. July 14, 2005: NEJM editor-in-chief Dr. Jeffrey Drazen tells NPR that the journal had been "hoodwinked" by Merck, and that the authors of the VIGOR paper should have told the journal about the additional data. August 2005: A Texas state jury returns a verdict against Merck in the first Vioxx liability case to go to trial. Some 13,000 lawsuits have been filed against the company on behalf of 23,000 plaintiffs who allege the drug caused heart attacks and strokes. November 2005: NEJM executive editor Dr. Gregory Curfman is deposed in connection with the Vioxx product-liability cases. At that time, he learns about the July 5, 2000, memo, which shows Merck VIGOR authors knew about heart attacks 18, 19 and 20 well before the paper was published in NEJM. December 2005: NEJM issues an "Expression of Concern," writing that "inaccuracies and deletions" in the VIGOR manuscript Merck submitted to the journal "call into question the integrity of the data." The journal asks the study authors to submit a correction to the journal. March 2006: VIGOR study authors respond to NEJM's Expression of Concern: "Our evaluation leads us to conclude that our original article followed appropriate clinical trial principles and does not require a correction." The three heart attacks in question, say the authors, occurred after the study's "prespecified cutoff date" for reporting cardiovascular problems. Journal editors stand by their call for a correction, replying that the cut-off date appeared to be selected shortly before the trial ended, and was a month earlier than VIGOR's cutoff date for gastrointestinal problems. Such a trial design, according to NEJM, "skewed" results. May 2006: Outside analysis of data sent to the FDA from the Vioxx APPROVe study show that the cardiovascular risks from Vioxx began shortly after patients started taking the drug. The data also indicate that the risks from Vioxx remain long after patients stop taking the drug. Merck disagrees with the analysis and maintains that patients aren't at risk unless they had taken the drug for more than 18 months. This point is worth billions for Merck. Many of those suing the company say they took Vioxx for less than 18 months. June 2006: The seventh trial against Merck begins, with plaintiff Elaine Doherty, 68, alleging the painkiller caused her heart attack and subsequent double heart bypass surgery. The trial, before the New Jersey superior court, is the first since the release of the new Vioxx research results. The data raises questions about how quickly the drug could cause harm and could undermine Merck's credibility. Out of the six cases that have already gone to trial, Merck has won three and lost three. Research published in the medical journal Lancet estimates that 88,000 Americans had heart attacks from taking Vioxx, and 38,000 of them died. November 2007: Merck announces it will pay $4.85 billion to end thousands of lawsuits over its painkiller Vioxx. The amount, to be paid into a so-called settlement fund, is believed to be the largest drug settlement ever. The Whitehouse Station, N.J.-based drug maker emphasized that it is not admitting fault. The settlement lets Merck avoid the personal-injury lawsuits of some 47,000 plaintiffs, and about 265 potential class-action cases filed by people or family members who claimed the drug proved fatal or injured its users.